As I grow into domesticated life, I found something that I once saw as a chore to be so much more than that. Most nights I volunteer to do the dishes. My wife is the primary cook, yet often we cook together (I get to cook the meat, which I very much enjoy and she does most of the other stuff). So I take on the dishes. 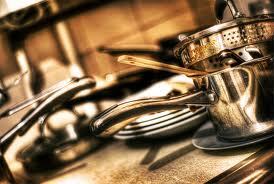 Dishes, until recently, were a necessary evil of eating at home. Yet lately they are beginning to become something more. When you look around at a kitchen full of pots and pans and the chaos of meal preparation, knowing where to begin is daunting. But as soon as those first dishes find their way to the dishwasher, when food makes its way to left over containers and back into the fridge, the feeling to getting somewhere takes over and the task becomes therapeutic. The act of taking chaos and bringing order becomes ritualized as it is repeated night after night. As pots get washed and cleaned, as surfaces are wiped down and the state of the kitchen is returned to a dormant state, a state of waiting for the next meal. There is a sense of being connected to the real passing of time, to the real experience of simple life. Michael Pollen’s interview with Jian Ghomeshi last week reminded me of my dishes ritual. As a food author, he spoke about our connection to food as human beings. How preparing, cooking, and eating food connects us to life, make us slow down. You (generally) have to put down the phone, stop the emailing, Facebook, twittering, browsing etc… to properly cook food (even if you are using a online recipe). That cooking is connection to where come from and to the cycle of life that we try so desperately to detach from most of the time. As a Pastor, I cannot help but see how my vocation is tied, on a deep level, to the act of preparing food, sharing meals, and cleaning up afterwards. This is the ritual action that I preside over week after week. Like a waiter presenting the weekly specials, I announce the meal that is being prepared and then serve it to the gathered people. But… there is something even more divine about the dishes. One particular night, after returning to the kitchen to the place of sane anticipation. Clean and waiting for the next meal, I observed that this must be what God experiences with us. Through mercy and forgiveness, by washing, cleaning, restoring, finding new places for partially eaten meals and preserved ingredients and left overs, God restores order and calm to our world. Sure it doesn’t take long to get messy and to become chaotic, but that is part of life. A sign of life being lived. We are like meals being cooked and served. Some days we are just sustenance, and others we are works of art and beauty. But it is God, always there, cleaning and washing, redeeming and showing mercy. So wash the dishes and know the divine, because cleaning up is a very sacred act.